Feed your winter cravings with these healthy pasta hacks. Love pasta? Some types are much healthier than others. Let's take a look. With winter well and truly under way, the craving for a warm bowl of bolognese or comforting carbonara couldn’t be stronger. Pasta is often frowned upon because of its carbohydrate level. But is it really that bad? How can we make this grain as healthy as possible? Firstly, let’s set the record straight. Pasta is a source of low-GI carbohydrate and a source of fibre, so the reason it often gets a bad rap is not for its own nutritional profile, but rather poor portion control or the sauces and side dishes that go with it. What’s a serve of pasta? One serve of cooked pasta is half a cup, this contains roughly 20g of carbohydrate and is approximately 500kJ. An easier way to remember this is that one serve of pasta should fit into a cupped hand. The Australian Dietary Guidelines recommend six serves of wholegrains (breads, cereals, grains etc.) a day for women, so depending on how you space out your wholegrain intake throughout the day, aiming for one serve of pasta as part of a main meal is acceptable. Learn to know what these portions looks like, awareness when eating out is crucial. Restaurants can easily serve two cups of cooked pasta (aka four serves) in the one main dish! Most pastas are made from semolina flour, making them low GI and reasonably high in protein, when compared to other grains. Look for ‘semolina’ or ‘durum’ flour to be first listed when looking at the ingredients list of packaged pasta. It’s not hard to find, with all leading supermarket brands being semolina pasta. Funnily enough, the size of the pasta could also matter. Choosing a smaller size like macaroni over a large pasta, like rigatoni, means you get more pieces, so it’ll feel like you’re eating more. You can however, get a more nutritious option by opting for wholemeal pasta, containing more fibre, iron and B group vitamins. But be careful, it’s tempting to fall into the trap of thinking that wholemeal is better/you can eat more of it. Whilst it has more fibre, it still contains a very similar amount of carbohydrate, so the portion size is still the same. If you’re celiac or gluten free, there are now some pretty decent options out there. Pulse pasta (made from ground legumes), chickpea pasta, buckwheat pasta or rice flour pasta are all now readily available. Many of these are also lower in carbs than traditional pasta, but the texture is slightly different. If you’re watching your total carb intake, konjac spaghetti could be something for you. Made from the Asian root vegetable konjac, it has hardly any carbs (less than 2g per serve), but it does taste much more like a noodle. Other lower carb options include black bean spaghetti (roughly 10g of carb per serve) or zoodles/zucchini zoodles, made with a spiralizer (roughly 5g carbs). If none of these tickle your fancy, just remember that portion control is key, and a smaller portion size of traditional pasta might be best. How every shopping basket should look, amirite?! What are the best ingredients for sauces? • Tomato based sauces are the best. They are much lower in fat than creamy sauces, and are still very versatile, add chili for a spicy arrabbiata or olives and capers for the classic puttanesca sauce. • Fresh herbs, garlic and onion are all great staples to make your sauce sing. • Veggies can easily be blended or grated into sauces: carrot, zucchini, mushroom and baby spinach all cook down really well. • If you&apos;re looking for a vegetarian or vegan sauce, brown lentils cook quite well to mimic beef mince, or canned jackfruit to mimic pork. • If you&apos;re craving a creamy kick, using evaporated milk instead of cream or subbing in ricotta cheese for heavy cream fillings are great options to cut down the saturated fat. Pasta eaten in bed = heaven. 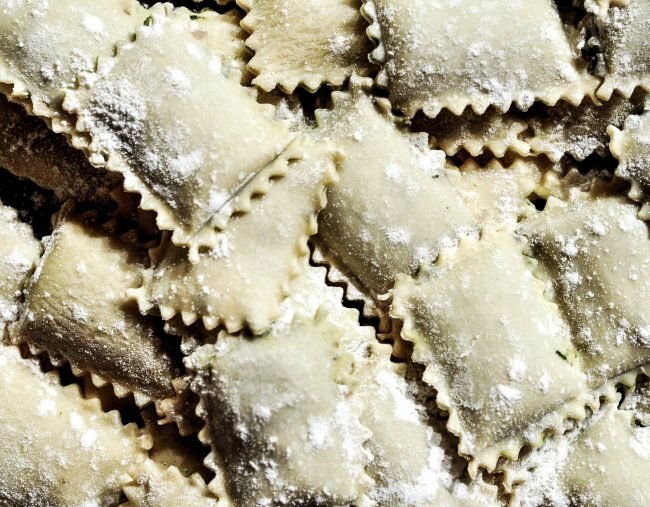 Pasta-wise, I’d suggest you steer clear of those made from regular white flour, these have a high GI, meaning they are broken down quickly by your body and won’t leave you feeling as full as traditional pasta. This type is commonly found in canned spaghetti and microwave meals. I’d also suggest you limit filled pastas like tortellini or ravioli and save those for special occasions. These are filled with meat or cheese and can really increase the calories quick. In terms of sauce, creamy sauces and pestos are definitely delicious, but they’re high in saturated fat and kilojoules. The meats you choose are also important, try to stay away from minced pork and veal or processed meats like chorizo and bacon, these are generally quite fatty and lower in protein. Pairing your pasta with lean beef mince, seafood or chicken breast are the better options to keep the fat level of the dish low. Finally, keep an eye on the cheese you sprinkle over the pasta, choosing something strong and bitey like a sharp parmesan instead of cheddar will give you more flavour for less kilojoules. What&apos;s your favourite pasta recipe? Tell us in the comments!